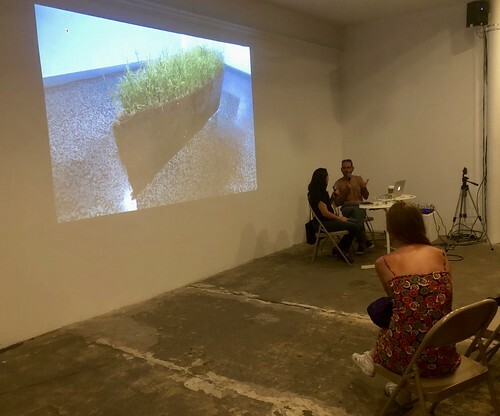 In dialogue with Meyken Barreto, the Cuban artist Jorge Otero share his views about the concept of Guajiro (*) / War-Hero and its implications as a symbol of national identity and their influence on his photographic and performance practice. By commenting a selection of works ranging from photography, print, performance, this discussion will offer an overview of Otero's practice and address other important topics related to his work such as universality and genre. At this occasion the public will be able to discover newly developed works created by the artist during his residency in New York. Through photography, as well as performance, video art, installation and drawing, Jorge Otero focuses on the representation of the human body marked by a keen interest in the imagery of the Cuban peasant and rural life in Cuba, and as sub topics themes relating to identity and emigration. Jorge Otero creates works that delve deep into the daily life of the ordinary individual and projects a reality which is tainted with the threat of war, disguised struggles and uncomfortable truces. The main character depicted is that of the hero, a survivor, a War Hero. Jorge Otera has exhibited internationally Solo exhibitions include: 2017 Guajirá, NG Art Gallery, Panama City and in 2015, War Hero Galería Habana, Cuba . His work has been featured in group shows at Robert MIiller Gallery (New York) with Nuevos Colores, (Art)Xiomas–CUBA AHORA: The Next Generation (2016), at the AMA (Art Museum of the Americas), Washington DC; Scope Fair, Miami, USA (2015). He was selected for the Gilbert Brownstone Foundation Residence in Paris (2015) and the Arts & Partage Foundation Residence in Aix-en-Provence, France. Article by Rigoberto Otaño Milián in artoncuba. Meyken Barreto is an art writer and curator. Previous positions include Regional Director at Artist Pension Trust (AT), Gallery Manager at Y Gallery in New York and Studio Manager at Los Carpinteros Studio in Madrid and Havana. She has taught at the Havana University and San Geronimo College in Havana. She has lectured in international institutions such as Universidad Complutense in Madrid and, Martin Luther University, Halle (Saale). She won Cuba’s National Curatorship Award in 2009 . She has recently curated the exhibition Cabinet or Curiosities: The whimsical world of Carlos de Medeiros at Guttenberg Arts, NJ in 2017; and co-curated the group exhibitions Divagation at Y Gallery in 2016, Pioneros: Building Cuba's Socialist Childhood at Aronson Galleries at Parsons, The New School for Design, New York in 2015, and Flow: Economies of the look and creativity in contemporary art from the Caribbean at IDB Cultural Center, Washington DC in 2014. She contributes to various art publications such as ArteCubano, Art OnCuba and Artnexus. This program is made possible with support from the Rockefeller Brothers Fund and the Cuban Artists Fund. This program is supported, in part, by public funds from the New York City Department of Cultural Affairs in partnership with the City Council.